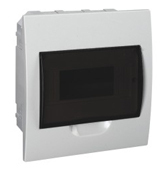 The distribution box is suitable for mounting of modular electric installation devices with maximum current up to 63A.The product,available with neutral and earth terminal block,DIN rail and function lable,is widely used in low voltage distribution networks for power supplying of consumers and commercial buildings. 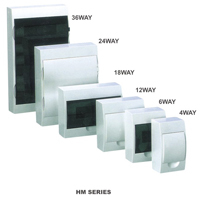 ■ With plastic door in arc shape design. ■ Knock-down segments designed for mounting of additional modular devices. ■ Black module : used to fill the empty , good for dust-proof and fix purpose.